Here's a big billboard for ManuLife right in the heart of Hanoi, Vietnam. For an investor in this company, this is a happy sign. I am elated to see that one of the companies establishing a foothold in emerging countries is this Canadian company I have invested in. 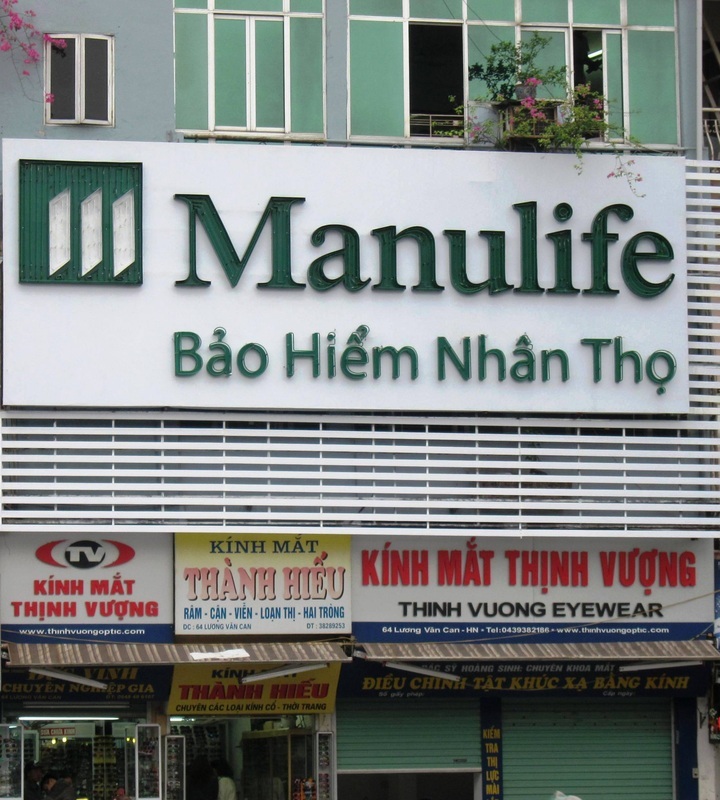 For the first 9 months of 2012 according to Viet Nam News, Manulife's total premiums and deposits increased by 22%. The other favourite insurance company is Sun Life and you know what? Sun Life has been in the Philippines since the 1800's and it is just getting stronger day by day. Go East now. Here is growth. Too often, many businesses are afraid of going internationally. And rightly so. The terrain for many of them is unfamiliar as well as the language, food, practices, ways of closing a deal, or just even the way you greet a possible business partner or the way you hand over your business card. Yes, too many unfamiliar things. You just don't want to go through the anxiety of not knowing what is going on or what is being said. Is it worth the trouble or not? While it is true that doing business internationally has its own set of challenges, there are countless rewards you can enjoy as well. Fool not yourself. If the rewards are not there, nobody would go on doing it. Challenges will always be there wherever you may be. Maybe a number of them are just similar to what you usually deal with in your home office. But, a few distinct ones can throw you off center a bit. So what? Maybe the lessons you learn from these unnerving experiences are worth millions or even billions to your company.